you’re right MM, it’s absolutely stunning! i prefer a phalaenopsis in the pot rather than a dozen of roses… happy valentine’s day to you and your family !! …I am in awe!….kay ganda!!! Oh, a word of caution…if you get his on your e-mail: subject: I am in love you or anything related to that in effect…DELETE! heard on the news it is a virus…botnet.something!!! The green pod or core whatever you call it is the a floristâ€™s delight either fresh or dried one in tropical flower arrangements. 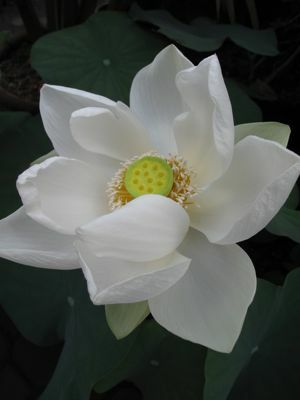 So pure and so white and so stunningly gorgeous lotus flower is. It sure symbolises serenity. Wish I could witness one in process of blooming. 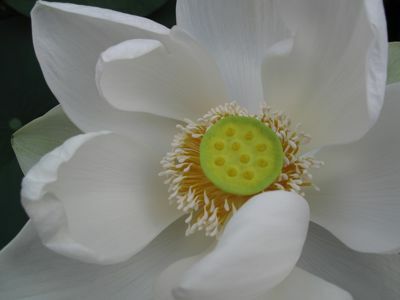 That lotus does look very beautiful and the fact that it opened up just after you closed the deal must be its way of telling you how happy it was to be going with someone who appreciates fine floras! For some time now, I’ve been looking for a potted plant that can ward off mosquitoes but at the same time, smells great. I’ve had tons of vague “I know something like that…” from friends and plant sellers in our area (Sta. Rosa, Laguna) but nothing really concrete. Any suggestions? tna: how boig is your yard? If you have a fairly big yard, citronella grass is your answer..it is the same plant that they use to extract the citronella oils they use to make those sprays or like katol. BUT it grows as tall as my son! But maybe you can put in the biggest BALDE you can find and let it grow there. Advantage if it is in container…though it may not grow as tall as it could if planted in the ground…you can move it from one spot to another and rub the leaves to release the oils. If you want potted flowers, MARIGOLD…pretty to look at but deadly to mosquitoes. Malayo pa kang sila, they will make a DETOUR! Hindi nila ma-take and amoy! It is not that offensive to humans though. Oh, but if you like scent….plant SCENTED LEAF geranium…MABANGO BUT offensive scent to mosquitoes…particularly if you plant the lemon scented ones. Advantage…this is so easy to propagate. For potted ones, too…rosemary. You can use for cooking at the same time….not the mosquitoes though maybe in Cambodia, they might! I have marigolds and almost all the gardeners in the Community gardens have marigolds for this purpose…mosquitoes and aphid repellant. BettyQ: Now you mentioned Citronella, I thought then it is the same as lemongrass. Citronella differs from lemongrass right? Thanks. Hey, MC! How are you? They both belong to the Cymbopogon family according to planetbotanic.ca…more like first cousins! If you have mosquito issues like we do have here…squish the leaves or one of the stalks and rub it on you ear lobes, your neck, your arm before you lounge on your patio chairs outside! Put a pot of marigold on the table! Very very pretty. I don’t like roses and this, along with the beautiful orchids in the previous post make for better alternatives. that is a gorgeous bloom! reaffirms your faith in ‘The Creator’. one of my faves is the common Rosal…the petals, the leaves and the heady scent! bettyq, that belongs to the camellia family right? BettyQ: Sorry for not mentioning it earlier, I have a very small garden space hence am limited to small plants to medium sized shrubs. Will look for marigolds, and maybe the geraniums…wish me luck and thanks for the help! I love lotuses! This photo is certainly a very welcome thing to see first thing in the morning! Do you know of a place in Manila where they are always sold?—for someone who has to go to Manila to buy herbs and other plants not sold in this province. Thanks, MM, as always! I am not sure if Gardenia and Camelia are cousins, Natie! But I think Rosal is a Gardenia. And yes, the scent, oh my!!! Isn’t it a perfume or cologne, too? Oh, yes, good luck, tna! I hope you find what you are looking for. Where are you? I think they sell geranium seeds. I know there are marigold seeds. I can send you mine….I have TONS!!! I will look it up on my seed catalogue (scented geranium) and I can send you some if they have it! Once it is thriving….so easy to propagate. In no time, you will have baby scented geraniums you can give away! Wow, BettyQ, bless your generous heart but I don’t want to impose. Let me check first if they have it here – I live in Sta. Rosa, Laguna, Philippines. Not an imposition at all, tna! Just let me know…MM, can I impose on you to send her my e-mail address please? Oh, if you want any more seeds, tna, that you would like to plant, let me know as well. am so glad to read this! my eldest daughter has the most sensitive skin. it easily gets irritated and even mosquito bites becomes ugly red blisters sometimes. I noticed too that mosquitos seem to hover over my kids more than their cousins when they are together. not good daw always use OFF lotion so i should have these plants around. maghahanap talaga ako nito. thanks for the info betty q!!! Jing, tna…avoid wearing black clothing. Mosquitoes daw are attracted to black colored clothing. …red comes next. White is your best choice …same goes for bees! There is an orchid farm in San Rafael, Bulacan that also has really huge lotuses grown in pots. Very pretty. Very educational comments…from a beautiful lotus! Happy valentine!! MARKETMAN/ZUBUCHON COPIED YOUR PRODUCT? DO YOU KNOW WHAT THE TERM “LIBEL” MEANS?